I am a weight watcher and definitely worth the points. Banana and chocolate great combination. I used Old Fashioned Oats – placed all but about 2 TB in to my Vitamin to make a little oat flour, then added in the two bananas. Dumped into a little bowl, added 2 TB of PB2 Powder and mini-chocolate chips. Wow, super happy about this. Will freeze to “avoid temptation” and have something available for cravings since I have nobody to share with. Thank you, great recipe! I made these cookies. They are simple to make and really delicious. A total winner?. I really liked these! I was skeptical because of all the negative comments, but they are great! I think of them more like oatmeal bites rather than cookies. They tasted awesome right out of the oven, and then I’ve been eating the leftover ones by hearing them in the microwave for a few seconds. I threw in a couple scoops of protein powder to kick them up a notch. Splendid turn-out. I tried these today; and liked them very much! I made them before work; and was able to take two with me for my breakfast! Thanks so much for all of the great ideas. Delicious! It’s like mini bites of banana bread with chocolate. Will definitely make it again. Whoops..not sure where the question marks came from. These were kid approved!! I’ve made these before and didn’t care for them, this time I added pb2 powder and salt and they were very good! Anyone know the Macros for 1? Made these today, great chewy chocolate cookie! I really enjoy these! Such a simple base to work from. Really great as is, or easily customizable to suit ones mood. I added a bit if honey to my last batch and they came out really great. Author said she ate 4 cookies for 4 points, but recipe says 2 cookies for 3 points. Big difference. ?? Delicious! I am going to try it with caramel bits and see how they turn out. I love caramel! Maybe even a mix of chocolate and caramel? Ooh! Thanks Gina! Love your recipes. Doubled recipe n made 12 cookies. They are great. Thx for this recipe. Calories are 100 per cookie? Needed a little something sweet for a snack with my hot tea. Yum! They would also be great for breakfast. O I used old fashioned and mini chocolate chips. I just made these today.. These are good. Delish! Any thoughts on amping up the protein? Any idea what the WW Feeestyle points are for these? Just made these and they are pretty dang good! I love, love , love these! I love chocolate chips, but O also love walnuts, so I did 1/8 cup chocolate chips and 1/8 cup of walnut pieces – total 1/4 cup. They turned out so moist and just delicious. Thank you! Im allergic to bananas what can I use in place? Pretty darn good! I used raisins instead of chocolate chips. Going to try them again with mini chocolate chips and applesauce for lower calorie chocolate chip cookies! 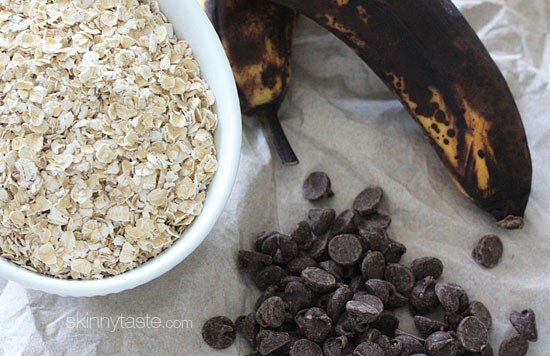 can you use regular rolled oats? Made these but they were not chewy, instead they were mushy…… any idea why? I love this recipe. So do the kids. Very easy and clean and tasty. I’ve put it in the ww calculator though, and get 6sp for four cookies while this site calls it 4sp. Just an FYI to other ww peeps. Ps. I didn’t add the bananas to the calculator, so they aren’t skewing the calculation. 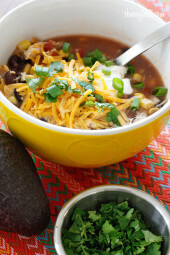 Would quick cooking steel cut oats work for this recipe??? That’s all I have in the house right now and want to make them before my son gets home from school. How many calories is this breakfast cookie if I subsistute the chocolate chips for raisins? • I usually have a batch of these stored in my freezer. • Great to eat when I let them defrost out of the freezer for 30 minutes. • Also edible straight out of the freezer with a cup of tea. • I use mini Choc Chips. • I sometime bake them in a silicon mini muffin pan to make them all the same size. My family absolutely LOVED these cookies!! Cant believe it was only 3 ingredients!! Can’t wait to try this! Just watching my bananas ripen, not very entertaining. For those who’ve added the PB2 – I read one comment which said 2 Tbsp? How about protein powder (simple whey, no flavorings). Would love to get a little more protein in there but need to avoid nuts so my kids can take them to school for snack. Ideas? Wondering how much saturated fat are in these? I’m trying to figure Weight Watchers smartpoints. Thank you! I used frozen bananas and made them into squares. They were amazing! It was like having banana bread!! Looks amazing! Will try tonight. Is each cookie 99 calories? Our family loves these!! I add much more (at least another cup) of oats. 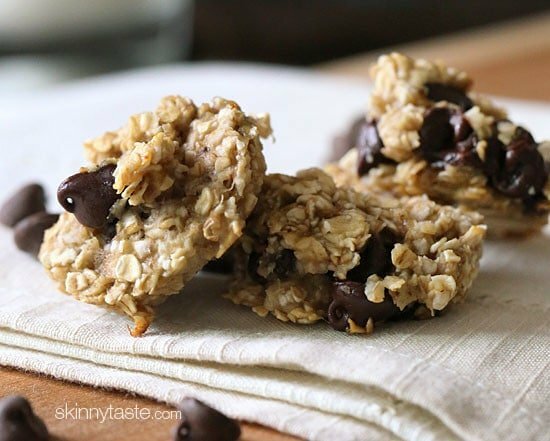 Not so mushy more like a no bake cookie. We also add chopped nuts. They are best right out of the oven. I used mini chips. Sprinkled them with cinnamon after taking them out of the oven. They freeze well also. Thank you for the recipe! I make these all the time. I secretly buy bananas just to make these. I’ve recently started mixing in 2 tbsp of PB2 and they are great! Thanks Gina – this has helped fill my pregnancy sweet cravings! Has anyone made them with old fashioned oats? Do I have to use quick oats (I have the other kind on hand). I made these last night before bed and they were great! I fell asleep easily and slept for the whole night. Bananas are high in tryptophan and melatonin and therefore are wonderful at helping resolve sleep issues. Of course, for that reason I would not have them in the morning. I used your recipe as a base and fooled around with it to make breakfast cookies for my granddaughter. 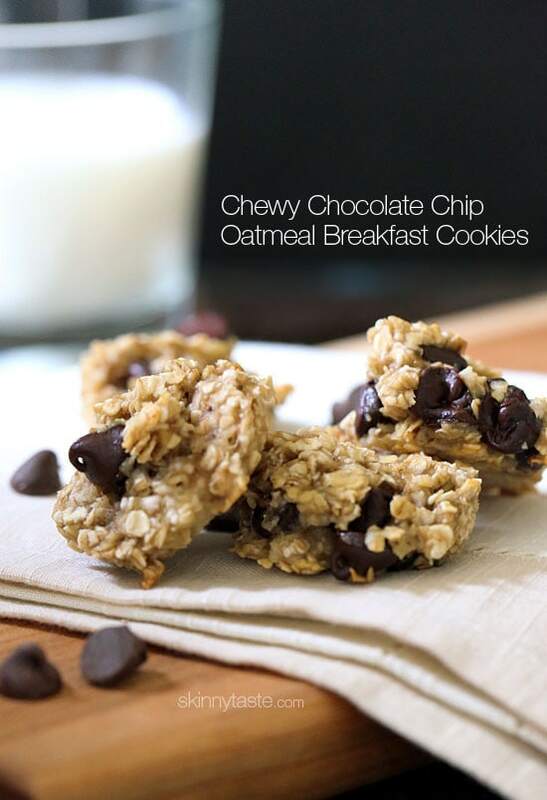 I used 3 bananas 1 1/2 cup oats, 1/2 cup almond meal, 1/4 cup each mini chocolate chips, crasins and carmal chips. Baked for 15 minutes. It made 15 cookies 110 calories each. She loved them! Just made these and they came out really good! I added in a pinch of cinnamon for a little flavor. Thanx for the easy recipe! Love these. I made them tonight, doubled the recipe, put in chocolate chips and walnuts I put them in a 9×13 pan and baked at 350 for I don’t know how long. Ha! I just watched them and took them out when they looked and smelled done. Excellent! I did use raisins along with the added 1/2 tsp salt, 2 tsp cinnamon and1/4 tsp nutmeg. It really helped! These are really good! I added salt, cinnamon and nutmeg to the recipe for more flavor. I made these today. I was craving a chocolate candy bar. They were really very good and hit the spot with only 1 point. Yummy. I love this and have made several versions. The most recent was to omit the chocolate chips and scoop 1 tbs of the banana/oatmeal mix into a mini muffin tin, used the back of the tablespoon to press down on the mix and create a ‘cup’. After baking as normal I then filled the ‘cup’ with sliced strawberries. They were great! i’ve been making these for a few years now, i see many variations out there, but i always start with this for a base… i add coconut, walnuts and mixed chocolate morsels…occasionally dried cranberries. and they last mud longer in the fridge if you like. i never make less than a double recipe tho. they’re my go to healthier than reg snack SNACK! Tried using steel cut oats– only one I have currently. Unfortunately, it was not as chewy as it could be if I used regular oats. Should I have cooked it longer? I added a tb of applesauce too. Great recipe. I’m excited to try it with regular oats. Love these! Made one addition. Chocolate peanut butter pb2 powder! Really great! Has anyone tried to freeze these? I thought they’d make a good post baby, breadtfeeding snack but doubt I’ll be up for making them when we get home from the hospital. I find them best out of the oven, but I haven’t tried freezing. I make up a large batch and freeze them all the time. 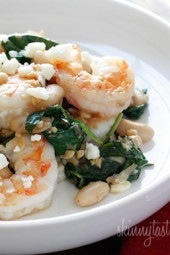 When ready to eat, let them sit out until thawed or pop in the microwave for a minute or less. It not only warms the cookie, but heats up that yummy chocolate, for the fresh out of the oven heated cookie. I also bake mine in the mini cupcake pans…just the right size for 1 or 2 bite cookies. Have you ever substituted applesauce for banana for the breakfast cookie? Could you replace the bananas with pumpkin? If so, about how much pumpkin? Thanks! These cookies were amazing. They were light and awesome. Kicked my sweet craving right out! I put them into my ww calculator and it says 4 smart points per 2 cookies! Is there something I’m missing here? Can’t figure out why it’s different ???? Has anyone ever frozen these? Thanks!! What types and brand of ingredients did you use? Adding up my ingredients I get 99 calories for 2 cookies. Very tasty breakfast bites, I added a splash of vanilla extract to up the flavor. I’m planning to add unsweetened shredded coconut next time. Many thanks to you Gina, my family and I LOVE yoire recipes! I’ve made these many times over the last few years, the only thing I do different is mini chocolate chips. I seem to be the odd man out based on other comments, but I actually prefer them cold from the fridge! So yummy. The only problem is that I have a hard time not grabbing one every time I open the fridge! These unfortunately turned out more mushy than chewy.. This is my husband and I all time favorite. I add coconut and a sprinkle of walnuts. Question. Refrigerate? Has anyone tried a substitute for the banana? The only thing I have come up with is sweet potato. I just can’t eat banana don’t like the flavor. Oh mylanta! My 4 year and I just made these!!!! Absolutely delicious! Definitely going to be making these again but with some berries next time. just made these yummy treats!!!! cant believe this how we can start our day guilt free lol!!!! kids loved them!!!! added vanilla and cinnamon and almonds and fresh heavy whip for dipping:) yummo.. and I used non ripe bananas… Just plain ol yellow skin bananas I just got from the store yesterday… first time stopping by this site!!! great start so far!!!! These were delicious!! Do you need to store these in the fridge? Love adding chia and flax, great idea! If I was to add ground flaxseed, how much would be needed? 1 tsp maybe? Thanks in advance! How much chia would you use? Also, what about ground flax, and how much? I like this idea, but want to end up with something edible and not too hard or runny. I just used a good tablespoon of chia seeds and a teaspoon of natural peanut butter! Taste amazing! I just made these with Red Mill 5 Grain Hot cereal and Lily’s chocolate chips sweetened with stevia. I added an extra bananas since they were small and put them in cupcake liners for easy grab and go. WOW they are awesome! I work early mornings and these are a great grab and go item! Definitely will be making these more! Made these today for a post workout snack because I’m always craving chocolate. 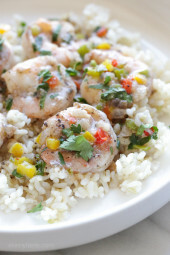 So tasty and easy! Will be trying with almonds or walnuts next. If you think they’re bland, try adding some vanilla and cinnamon. The texture is weird, but that’s because it’s just bananas and oatmeal, otherwise, these are pretty good. Can you freeze these after making or do you need to eat them right away? They are best if eaten right away, you can make half of you want less. Does that mean you CAN’T freeze them? I doubled the recipe. I did half with chocolate chips and walnuts and the other half with the nuts and craisens. Both were yummy! Thanks for the healthy breakfast or treat option. (I used 5 bananas total, doubling the recipe. Two were frozen. I drained and smashed the liquid out of these so they wouldn’t be as runny. I dont know if they’d turn out using all frozen since they’d end up being runnier). Can you make them with any other fruit? I can’t eat bananas. I use unsweetened applesauce (the same amount as the oats). They are great! Can I use frozen bananas that were ripe so I froze them ?? I haven’t tried it with frozen bananas, If you do let me know how they come out! I used frozen bananas. I partially thawed them in the microwave so they didn’t get watery. I think they turned out great. I haven’t made these yet, but I do find frozen bananas seemto have more liquid once thawed than over ripe fresh ones do. Hi, I am wondering if there is a substitute that I can use for the bananas. as am allergic to bananas and cannot use them. Try Peanut Butter, Almond Butter, etc.. Pretty much the same consistency as bananas. I’ve made these for breakfast twice. I like to half the recipe and make smaller cookies, that way I feel like I am eating more 🙂 These are great! Hey, when I calculate the SmartPoints on this recipe it comes out as 4 points, yet it says 3 at the top. Any ideas what’s going on? It’s because in the recipe builder the bananas, even though they add sugar grams to the overall nutritional analysis, get counted as zero points, so the only points are from the oats and choc chips. But if you use the calculator it just uses the total sugar grams (not differentiating the choc sugar from the banana sugar!) and adds the extra point. So in this case 3 is the more accurate count ???? Put the recipe in my ww recipe builder and it says only 2 smart points for 2 cookies! Any idea on the points plus amount through WW for 2 cookies? How many calories does each cookie has?? These sounded so awesome, but they were not good at all. Only if I really had no other options, would I eat these again. I loved all the ingredients, but after taking them out of the oven and eating them, they were only "ok". The next day, no. Just no. I've loved every recipe I've made from this website, but this one was just not good at all. 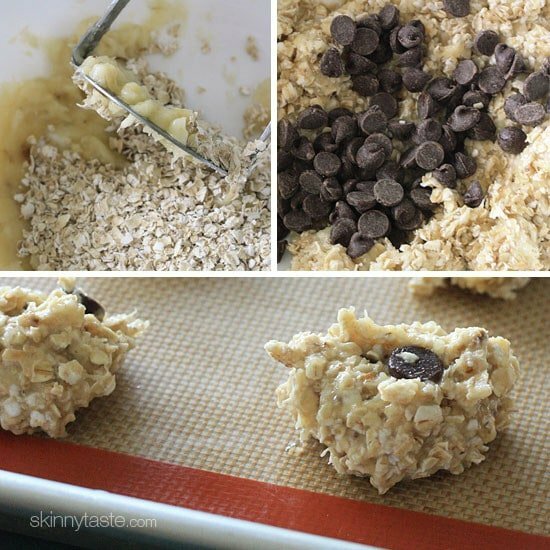 This is how I have always made your "healthy" cookies since I don't like nuts. Although, I use mini chocolate chips because I find they stay in the cookies better. Made these last night. My son and husband ate them up! Celiac here. Could I maybe substitute quinoa somehow for the oats? For some reason I can't eat gluten free oats. Can you add in some all natural peanut butter to these? PB2 (powdered peanut butter) would work to add the pb flavor without adding a lot of fat or changing the consistency much. I was a bit curious with this one….they are amazing! I am usually skeptical of a lot of recipes just because I am (I am super picky)….I have to say I am addicted to these little cookies. I have so far made some with nuts and the chocolate chips (which are my fav). I made mine with Old Fashioned Oats (didn't chop them) and they were perfect. I do have to agree they are best out of the oven but stored in a container for 1 day in the fridge-not bad (they usually don't last that long though). Love these!